KCATA will soon be offering a free Student Pass to high school students. Three school districts, Kansas City Public Schools, Hickman Mills C-1 School District and Center Public School District, are participating in a one-year pilot program to supplement current school bus transportation and allow students to connect to opportunities for jobs, internships and extra-curricular activities outside of regular school hours. Drummers from Central High School’s marching band welcomed reporters, KCATA staff and elected officials and supporters, while cheerleaders represented their schools inside. “I know you always hear it, ‘Talent has no zip code, but opportunity does,’ and it’s our job as your transit authority to open that lock on opportunity – to give people access, options and opportunity,” Makinen said. The pilot program will collect data on how many students use public transportation, as well as recognizing which districts use it more. “When you think about this, these are endless opportunities for our students in terms of transportation – getting to and from school, a variety of school events. It provides economic benefit to them as well,” said Yolanda Cargile, superintendent of the Hickman Mills School District, and graduate of the district. She encouraged students, especially those in the room to take advantage of the multitude of opportunities now available to them. Ty-ree Wilson, a senior at Central Academy of Excellence, is in the ROTC program at Central, which includes morning physical training and running concession stands at school events. Kansas City Public Schools Superintendent Mark Bedell pointed out the mobility rate between school districts and how the three districts involved tend to share students. He said on his first day as superintendent, something he noticed was that some students didn’t get picked up – even his own. That’s when conversations started to improve the transportation in Kansas City’s educational ecosystem. Bedell said especially with the economic development taking place in other areas of the city, Northeast students will be able to seek meaningful employment outside the neighborhood. Since the district is focused on social and emotional support of students, he wants kids involved in extra-curriculars and eliminate barriers to create active participants. Mayor Sly James said he is proud Kansas City has this one-of-a-kind program and how it will enable students to become well-rounded people. He also recognized Makinen’s dedication to community-based transportation solutions. From giving students and veterans free rides to making buses more accessible to the disabled, Makinen has been “extremely impressive and innovative” in finding solutions to Kansas City’s transportation issues. “More than anything, we want you to get exposed, and know that you’re not just high school students, we see you as our future in Kansas City, and so this is just a small investment by RideKC and so many others to say we believe in you, we believe in your potential, and we don’t want anything to be a limit on the potential you all have today,” Councilman Quentin Lucas said to the students in attendance. Lucas said the program will be outstanding. 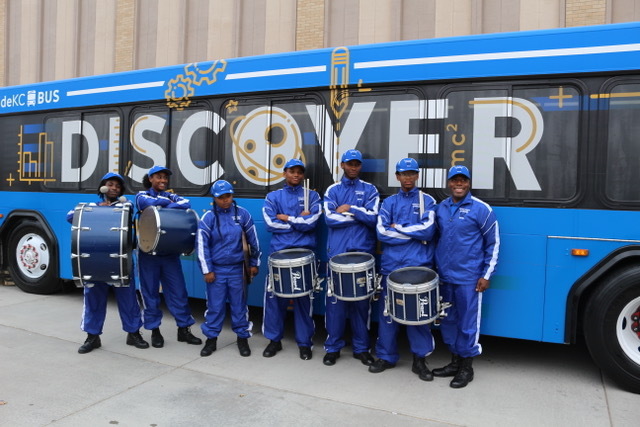 When students see the blue RideKC buses, he hopes they think of the opportunity for them to get almost anywhere. Chief External Affairs Officer for KCATA Cindy Baker said no additional funding is used because none of the routes changed and the buses have capacity. This is also another way to boost ridership. The pilot program only includes public schools, but she said they have already started talking with area charter schools and other districts for expansion of the program in the future. Makinen said that the next steps include gathering data on how many students actually use public transportation and expanding it to North Kansas City and other school districts in the KCATA area. Senator Kiki Curls said she was proud to be part of the legislative action in Jefferson City that needed to take place in order for the partnership to exist. “We want to make sure, of course, that our students have the tools they need for them to be successful so that they can participate in worthwhile activities related to their education, and it’s an exciting opportunity and partnership,” Curls said. Ninth through 12th grade students are required to turn in a permission slip from their parents, but cards have already started to be processed. Baker said students should all have the passes in November.